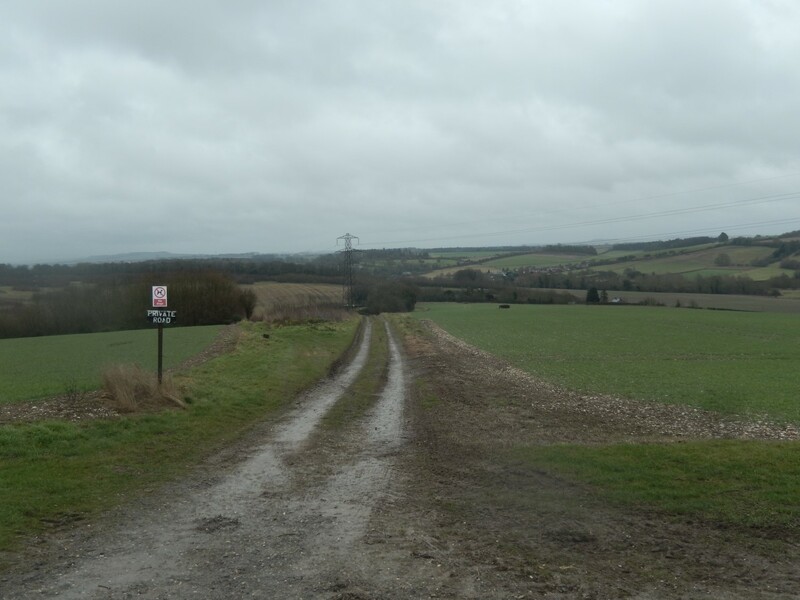 This is an event that has been run annually by Amesbury Walkers (at least, for the past few years – before that, I believe it might’ve been organised by a Wiltshire Long Distance Walker’s group). You can choose to walk 10km, 20km, 30km or 40km but, given the time of year, you’re expected to finish before 16.00. Naturally, the 40km route is mainly for runners (of which, we saw quite a few, although mostly doing the 30km challenge)… That’s about twnety-five miles and, unless you’re able to start very early (and, perhaps, jog part of the way), it’s hard to imagine anyone walking the route being able to finish in time. Only five of us from Brunel Walking Group were registered in advance and looking to attend. Three signed up for the 20km walk; two of us braved the 30km. Registration was only a couple of pounds per person (this walk, unlike many others, is not in aid of any charity), with the option to buy a certificate and badge at the end. We agreed to arrive for 8am. I arrived around ten-minutes later – by which time, many people were already collecting their written guides, checkpoint cards and beginning their walk. Apparently, there were something in the region of five-hundred people taking part. Average was probably somewhere “post mid-life”… A few dogs were taking part as well. 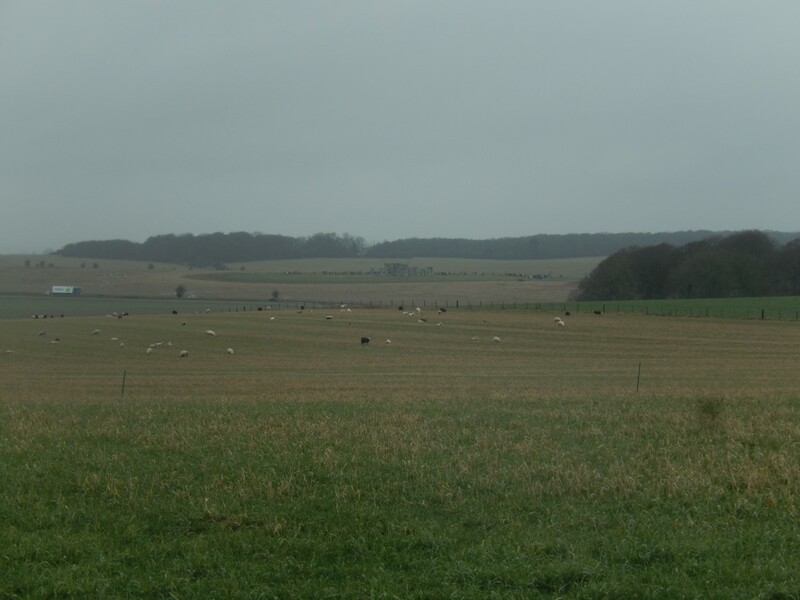 If you know Wiltshire at all then you’ll know that much of the landscape is very flat, open and plain. Where there are hills, ascent is barely comparable to what you may find in another region. I can only remember significantly challenging climb (which only features in the 30km and 40km events) and that took us from Upper Woodford, up and across Boreland Hill via a tarmac driveway. 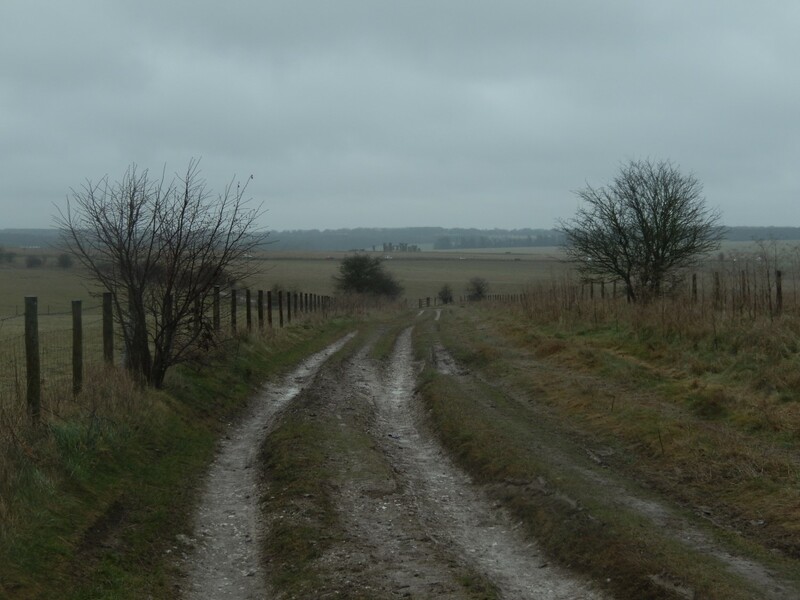 Along with the muddy bits (unavoidable, at this time of year), the majority of this walk seemed to follow tracks, bridleways and byways. More than I am personally used to but something I may have to prepare myself for, closer to the summer. Weather-wise, the forecast for this day was quite terrible. Heavy rain, as I recall. I briefly contemplated the idea of dropping down to the 20km route but then decided that I was there, I had signed up for the 30km and, you never know, I may not be able to re-attempt it in 2018. 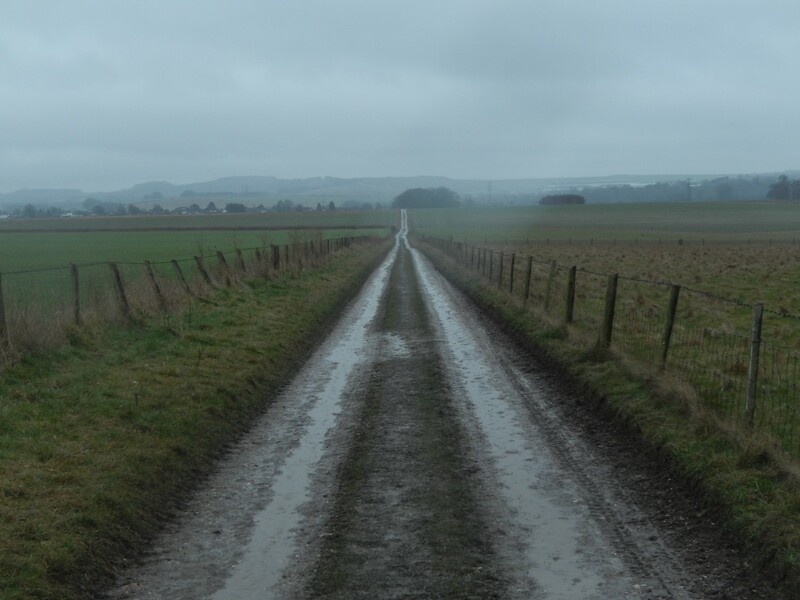 We had a few spells of light rain but the worst of it fell from about 15.00 onwards, in our final hour of the walk. 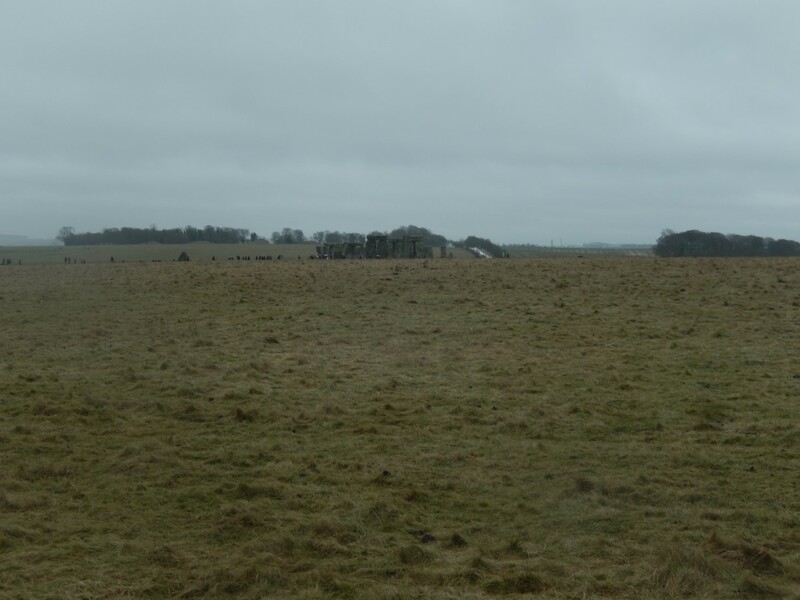 It turned the final leg from Stonehenge itself in to quite the slog. We finished at about 16.20. By then, water was already pouring off the roads in Amesbury, down the drains and in to the river. My £25 “showerproof” trousers had begun to let water in and soaked my baselayer. We left puddles on the floor back at the sports centre, before learning that we weren’t the last to finish – an army of cadets, dressed only in camouflage clothing and sturdy boots, trailed in behind us. They looked cold! But had also successfully completed the 30km route and were destined for another training event elsewhere (I forget, now). 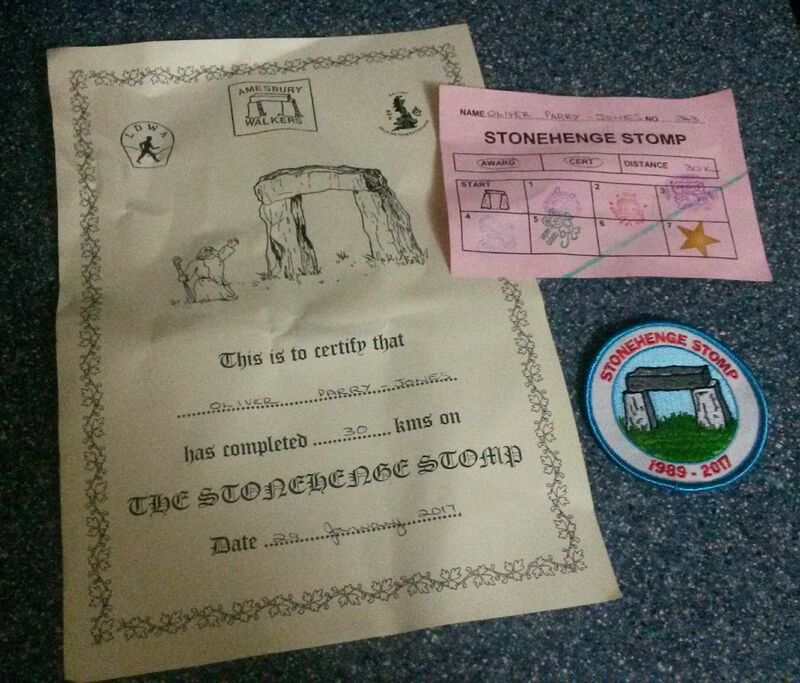 Another certificate and badge for my growing collection, then. 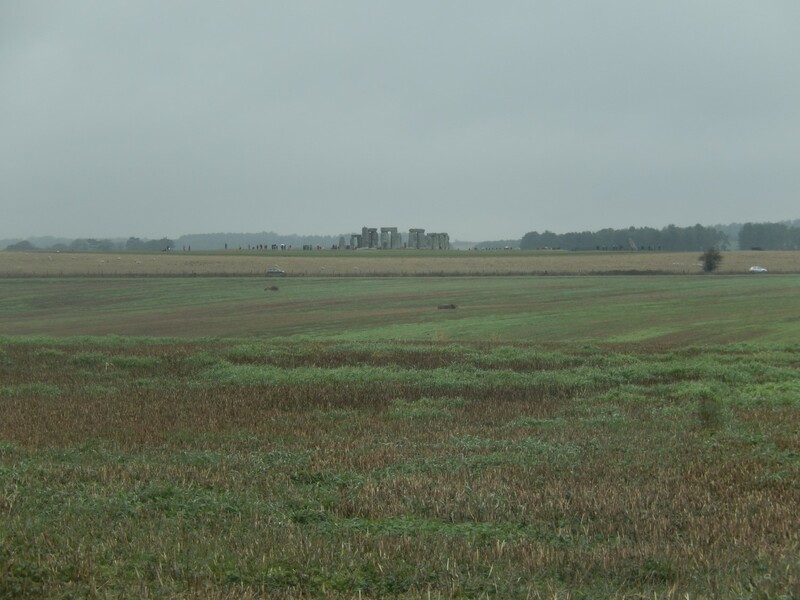 There’s concern that this may be the last time the Stonehenge Stomp takes place – it’s been running since 1989 but the event now requires someone else to organise and maintain its survival… Hopefully, something will happen. If you’re interested in the route and have an Ordnance Survey account, you may find this link useful. Otherwise, I think you can find it with a Google image search. Sounds like a great walk, although shame about the rain at the end. I like organised walks that aren’t for charity, because I think there are better ways of raising money than asking people to sponsor you to, basically, have fun. (It’s a personal beef of mine!) Hope the Stomp finds a new host and continues.